A Toter, or Mobile Home Toter is a tractor unit specifically designed for the modular and manufactured housing industries. Some toters are highly adapted for purposes of delivering or removing mobile homes on smaller home sites. Others look and operate similar to over-the-road semi-trailer tractors with longer wheelbases and sleeper cabs. 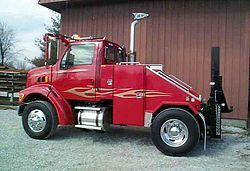 The toter is often confused or mistaken for a semi-trailer tractor. The key difference between the two is in the method of coupling. Toters are equipped with a 2-5/16" (59 mm) diameter ball that couples with the tow hitch on the tongue of a mobile or manufactured home or the removable transport frame of a modular home. Semi-trailer tractors have fifth wheel couplings designed to couple to a semi-trailer. Some Toters are hybrids, with both a fifth wheel and a ball hitch. The ball and hitch is a more fitting design for the height demands of the housing industry considering that the homes must still be transported down public roads with overhead cables and overpasses. Toters are required to have extending mirrors. Home sections widths range from eight to eighteen feet. Toters have mirrors that can extend (manually, by electric motor, or hydraulically) to enable the operator to see beyond the unit. This increases safety for public road situations. The mirrors also enable the operator to better navigate narrow roads and obstacles such as signs, mailboxes, trees, and other automobiles. Look up toter in Wiktionary, the free dictionary.